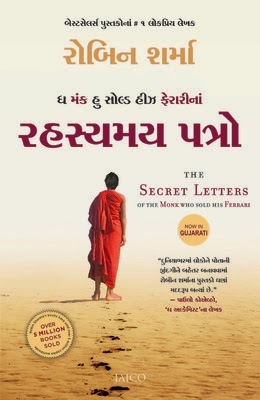 This is the Gujarati version of the self-help book, The Secret Letters of the Monk Who Sold His Ferrari, penned by Robin Sharma. Julian Mantle has been ill. So he sends his nephew on a journey to bring back his keepsakes and secret letters. His writings reflect all that he has learned about living life to the fullest. The collection of these letters could be a legacy Mantle can leave for anyone. The journey starts from the Bosphorus River in Turkey to a secluded fishing community in India and the necropolises of Paris. The letters possess those messages that will show readers how to live a meaningful and contented life. Robin Sharma is an esteemed author and lawyer. He was born in Canada in 1965 and completed his graduation at the Dalhousie University School of Law. He is the Founder, CEO, and the Chief Visionary Officer of the global consultancy firm called the Sharma Leadership International Inc. The company’s client list includes some of the most reputed companies such as GE, FedEx, Nike, Harvard Business School, and many more Fortune 500 companies. Robin Sharma was honoured with the Brand Laureate Brand Personality Award in the year 2009 and the Golden Gavel Award in the year 2011. He frequently visits different countries as a motivational speaker. His books have been translated to more than seventy languages and are being sold in about sixty countries. Some of the famous books penned by Robin Sharma are: The Leader Who Had No Title, Who Will Cry When You Die: Life Lessons From The Monk Who Sold His Ferrari, The Saint, The Surfer, And The CEO: A Remarkable Story About Living Your Heart's Desires, Megaliving!, and Discover Your Destiny With The Monk Who Sold His Ferrari.